The bore is designed to be able to hold 25.6 million gallons (96.9 million litres) of stormwater and sewage during heavy rain events and control nine of the overflows into the Ohio & Erie Canal and Little Cuyahoga River. The project is worth US$184.1 million (€160.2 million). 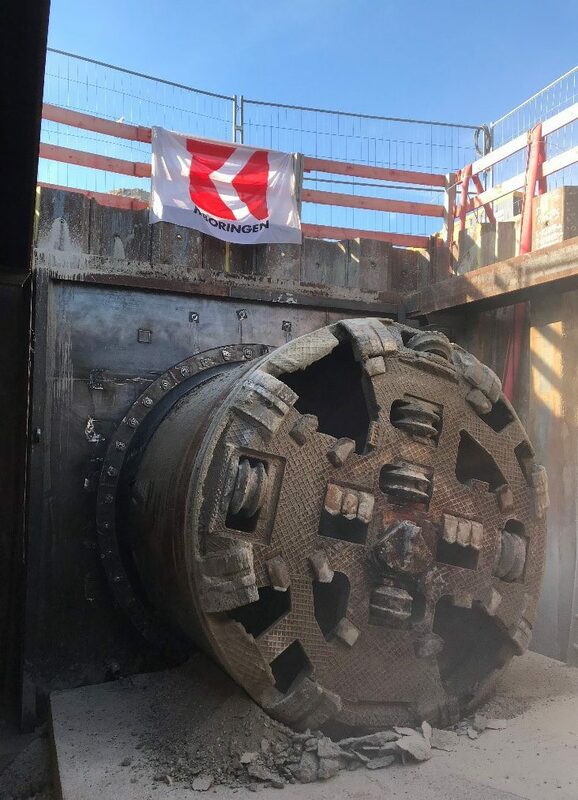 The tunnel boring machine selected for the project was a Robbins Crossover (XRE) EPB, Single Shield machine which undertook tunnelling works from October 2017 to a breakthrough on August 2018. Navigation for the drive was provided by VMT using TUnIS Navigation TBMLaser, along with a VMT TUnIS Ring Sequencing system. The client also required the installation of a VMT Modular System for automated Deformation Monitoring MODUS during the construction phase. VMT’s challenge for this project was that the company had not previously installed a navigation system on a Robbins TBM. 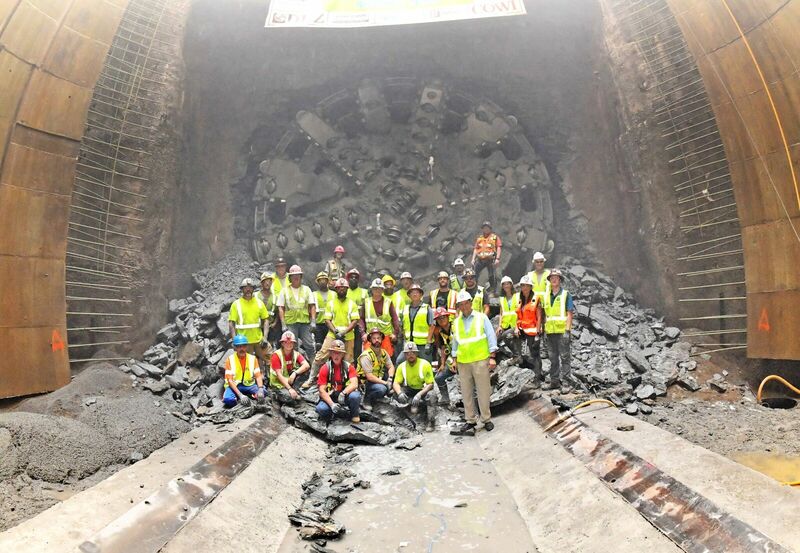 The team in the US however had experienced the installation of the same type of system on about 50 projects but on a TBM from a different manufacturer (Herrenknecht). The navigation system was also required to handle four (4) 1,000 ft (305 m) radius curves that formed part of the tunnel alignment design. The ring sequencing system was designed to ensure the correct installation of the eight (8) segment 5 ft (1.5 m) long tunnel lining support rings. Modular System for automated Deformation Monitoring MODUS was installed subsequent to discussions with the client which highlighted the immediate advantages and forward-looking performance advantages of the system. Modular System for automated Deformation Monitoring MODUS can evaluate and assess geometric changes in buildings etc. with sensors installed and their measured values continuously analysed. When critical changes occur, automatic warning and alarm messages are sent via email or SMS to appointed personnel to enable immediate action to be taken. Modular System for automated Deformation Monitoring MODUS can be designed to fit customer requests and includes all the necessary hardware, geo-sensor networks for gathering data and equipment for transferring information into a database. It also includes TUnIS Deformation Monitoring software for data analysis, reporting and alarm management. Despite this being the first installation of a VMT Navigation system on to a Robbins TBM, there were issues arising that could not be addressed with the TBM crew and those that did arise were dealt with quickly and effectively. Neustadt an der Donau is a town in Lower Bavaria region of Germany, located on the River Danube. Recently there was requirement for the installation of a new 1,000 mm diameter gas pipeline over a length of some 1,260 m.
The route of the pipeline ran beneath a forested area and under three local rivers. Contractor K-Boringen, of Hasselt, Belgium was awarded the work to install the new pipeline, which was part of the Donaudüker Neustadt an der Donau project. 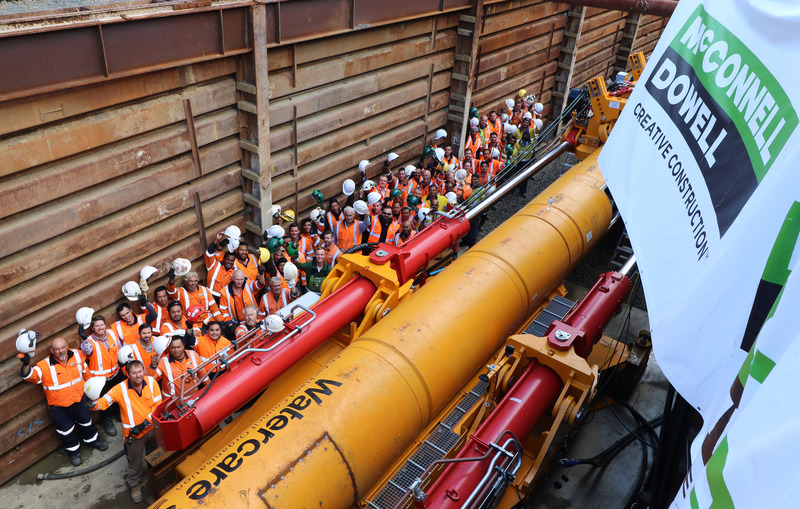 Not only did the installation have to cover the 1,260 m length but it also had, as part of the design route, a vertical curve with a minimum bend radius of 2,000 m. The installation of the pipeline took place between 23 April and 10 August 2018 using the microtunnelling technique. The microtunnelling system used was a Herrenknecht AVN unit. To ensure the installation precisely followed the planned route the contractor utilised a VMT SLS-Microtunnelling LT guidance system that K-Boringen already owned, K-Boringen having had a long-term working relationship with VMT over many years and many tunnelling operations. The SLS-Microtunnelling LT guidance system is designed to navigate curved and long distance drives using a motorised total station and laser target unit to determine the horizontal and vertical position, pitch and roll of the TBM/Microtunneller. It operates irrespective of any drift or refraction and requires fewer check measurements than other systems. Additional benefits include automatic measurement of the excavated tunnel, continuous tracking of tunnel movement as well as the option to perform system measurements during the bore advance. The Neustadt an der Donau bore was completed on time and in budget without the need to utilise any form of gyroscopic measuring assistance. Whilst undertaking the modernisation of a wastewater treatment plant near Auckland, New Zealand a new sea outfall pipeline was required. After careful consideration of the options available it was decided to utilise the innovative Direct Pipe® technology developed by Herrenknecht AG to install the new outfall over a length of 1,930 meters. The new sea outfall not only increases the treatment plant’s capacity, but also over such a length sets a new distance world record for an installation using the Direct Pipe® technology. 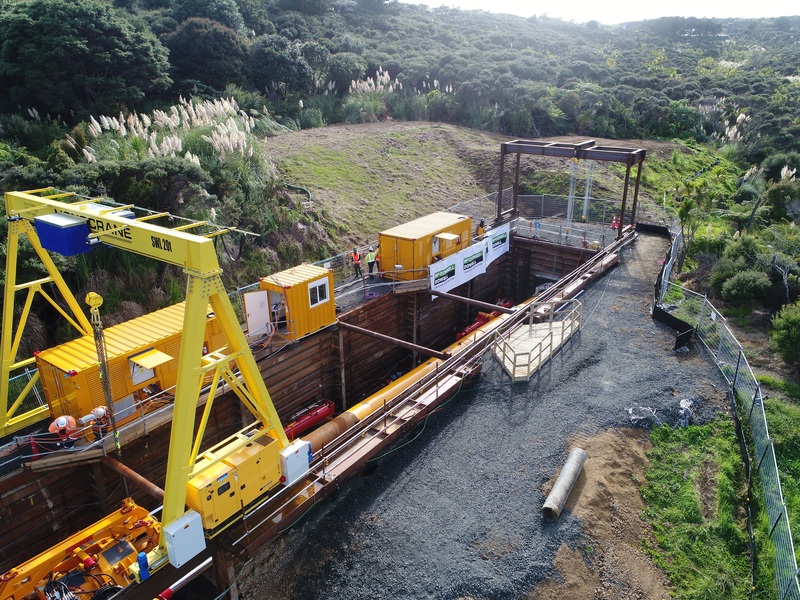 Just under four months after launch, the site crew for contractor McConnell Dowell in New Zealand’s Whangaparaoa reported the successful breakthrough of ‘Blanche’, the microtunnelling machine used for the Direct Pipe® Drive. Watercare’s Army Bay Wastewater Treatment Plant project, on the Hibiscus Coast near Auckland, will create an additional 2.9 kilometer long sea outfall. The pipeline connects the pump station with the discharge point, about one kilometer off the coast significantly increasing the capacity of the wastewater treatment plant. Special attention was given to environmental protection so as not to have an impact on the surrounding recreational and fishing area nor could the local flora and fauna be affected. This fauna includes kiwis, New Zealand’s national symbol, which are under special protection. The Direct Pipe® method is ideal for such sensitive installations. Herrenknecht’s patented pipeline installation method uses an AVN microtunnelling machine to create the bore. The pipe string is attached to the microtunnelling machine and is simultaneously inserted during the tunnelling process, with the help of a ‘Pipe Thruster’. With pushing power of up to 750 tonnes, it thrusts the pipeline into the ground allowing pipeline installation to take place in one single step. In this way, the environmental impact remains low and the landscape remains intact. The bore required not only the world record length but also had to accommodate a 1,262 m minimum radius curve. So, for its part VMT provided the guidance system for the microtunneler comprising a Universal Navigation System (U.N.S.). The U.N.S. is available for straight bores up to 400 m or long and/or curved drive. The straight line system uses a laser system allied with the Hydrostatic Water Level (HWL) system to overcome influences in the drive as the bore lengthens. For the curved New Zealand project the second U.N.S. option was utilised which uses a north-seeking gyrocompass, which when installed in the microtunneller does not need a line of sight to the launch shaft, to calculate the horizontal position of the machine. The vertical deviation of the TBM position from the designed tunnel alignment is calculated using an integrated HWL system. Overall, the drive went smoothly and on target with the AVN machine being lifted out of the sea at the outfall and towed ashore. The new discharge at Watercare’s Army Bay Wastewater Treatment Plant is scheduled to enter into operation early next year and will equip the facility for future population growth. Als Controller/-in durch und durch erstellen Sie in Zusammenarbeit mit den Projektingenieuren/-innen Plankalkulationen und aktualisieren diese während des Projektverlaufes in Abstimmung mit dem/der Projektleiter/-in. Routiniert überwachen Sie die Projektabwicklung und die Kostenentwicklung bei aktiven Projekten anhand der Meilensteine bzw. des Kostenbudgets und prüfen die Projektkontierungen in Abstimmung mit der Buchhaltung. Aufgrund Ihrer analytischen Fähigkeiten erstellen Sie Projekt-Forecasts für das laufende und zukünftige Geschäftsjahr. Im Rahmen der Projektabwicklung führen Sie ein aktives Forderungsmanagement durch. Ihr technisches Verständnis setzen Sie im Change-Management, bei der Integration von Prozessen sowie dem Schnittstellenmanagement unseres ERP-Systems SIVAS zu unserer Buchhaltungssoftware SBS ein. The Boßler Tunnel, currently under construction is part of the new NBS Wendlingen-Ulm high-speed railway. At 8,806 metres (28,891 ft) long, the tunnel is being built as two parallel single-track tunnels which will run between Aichelberg and Mühlhausen im Täle under the Roter Wasen and the Boßler Mountain. 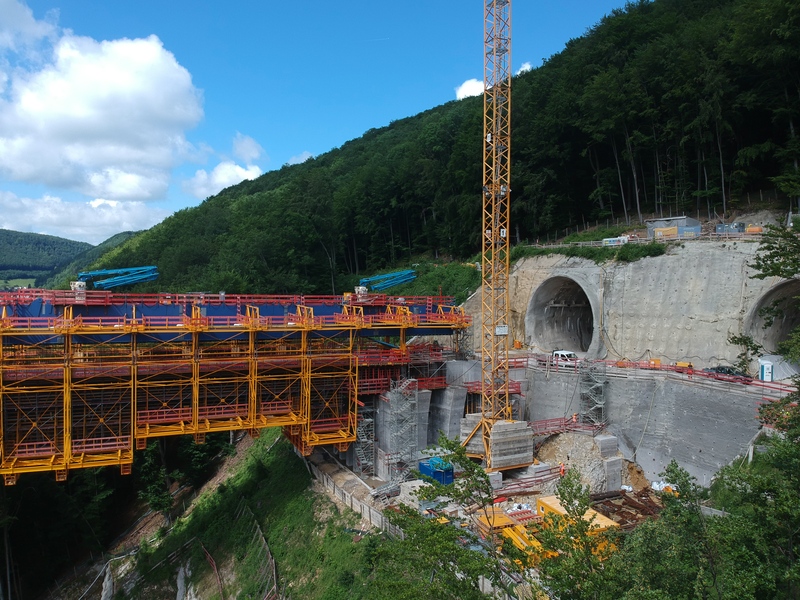 It is one of a series of tunnels underneath the Swabian Jura range and when completed, it will be the longest tunnel on the new rail line and the fifth longest tunnel in Germany. Tunnelling began back in 2015 when the East bound tunnel was commenced. This drive was completed in November 2016. 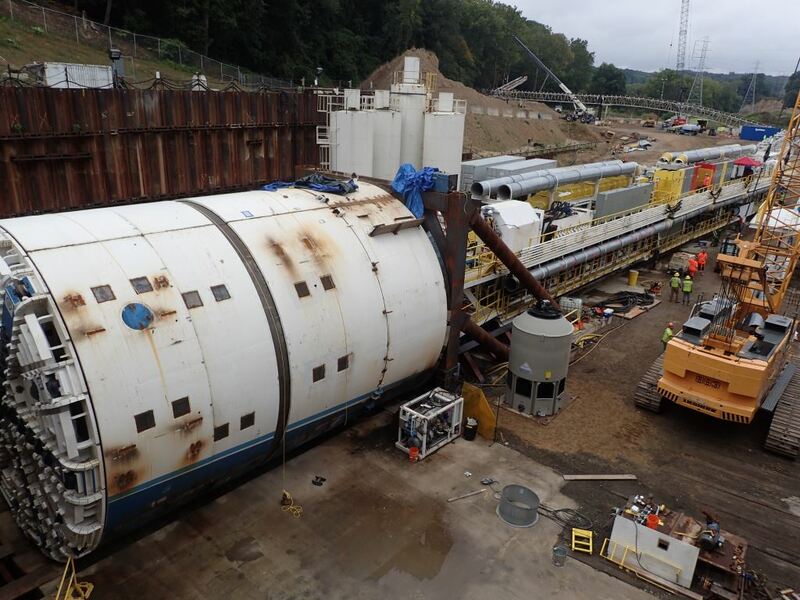 The most section was the Westbound tunnel which started construction in April 2017 with the large diameter TBM holing through in June 2018. 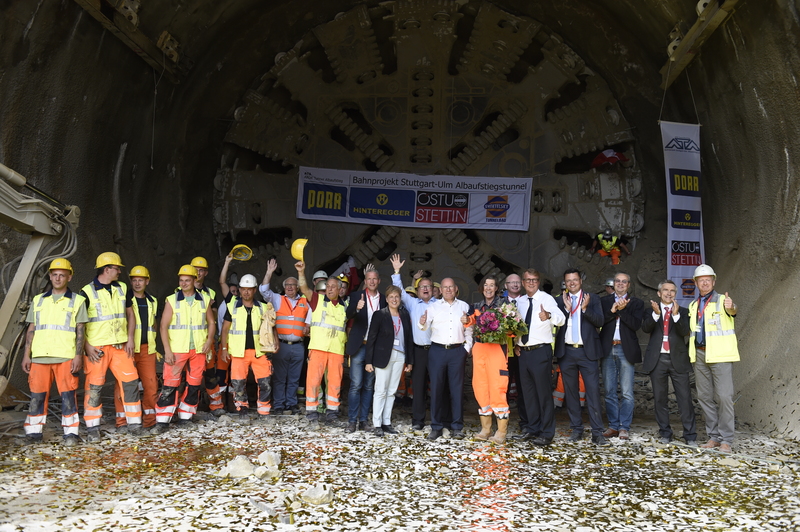 The 11.34 m diameter, Herrenknecht-manufactured TBM successfully recently completed the second of the two bores. The first bore was 8,822 m long and the second was 8,806m long each having a minimum curve radius of 2,306 m. The two tunnels exit the underground section of the railway line directly at the start of the new ‘Filstalbrücke’, a 485 m long and 85 m high bridge over the Filstal River and highway A8. Segment Documentation System SDS – which can aid the production processes, storage, transport and monitoring of the tunnel support segments from the first order to produce a segment to it final installation at the tunnel face. Ring Convergence Measurement System RCMS – which aids detection of potential risks caused by deformation forces due to ground movement or other forces experience in the segments during and after installation. Automatic Tailskin Clearance Measurement System SLuM Ultra 3.0 – which enhances the ring build process by measuring the last ring position relative to the TBM tailskin axis with millimetre-accuracy. The project also utilised a HADES information and communication system throughout the works. In this instance the VDMS and SDS systems were interfaced to maximise data availability as this project, apart from one other the Koralmtunnel (KAT 2), has required the most significant adaptation of the SDS system to date in order to meet the project requirements.